Thanks for writing Teach. I was a waiter myself while studying, at the only Baron in Pretoria. It was actually kind of fun and rather educational for all the wrong reasons. 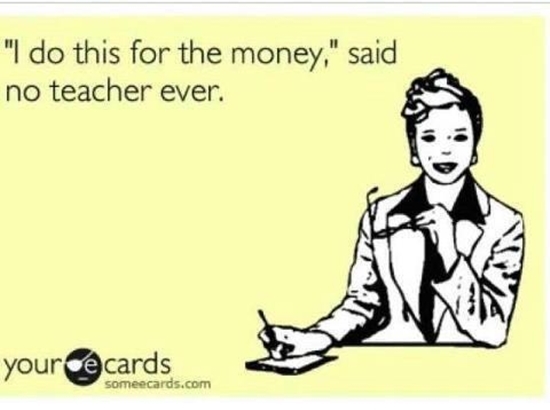 You’re right though, to a student it really is a decent amount of money. As long as you can manage to keep on top of your studying, try to keep that job. It’ll be quite useful as I’ll show you later. I’ve also had a lot of family members in teaching. My mom was one for many years, my brother did a stint in a school library, and I have a cousin who teaches right now. I know that they really are underpaid if you consider how influential they are to so many young people. Now you’ll be very happy to know that the chances of you having R10 million by the time you retire is practically guaranteed. You’ll be far less happy to know that due to inflation, it’ll only be the equivalent of around R650 000 in today’s terms. If that’s all you have to show for yourself after 47 years of work I’m afraid it’s not going to be such a good retirement, unless you can find a way to live on one 300th of that, just R2200 a month. What I imagine you were actually asking, is if you could reach the equivalent of R10 million in today’s money by the time you’re 65. Now that is a great question, and one I’m really glad you asked, particularly considering you’re going into the teaching profession. I often write about how you can retire very early if you save a large chunk of your income, and every now and then I get a comment from someone who says they have non-negotiable expenses and that normal people just can’t save enough. 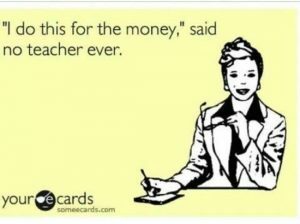 Luckily for them, and for me, a future teacher is about as normal as you can get. Maybe even slightly lower than normal in terms of earnings, so if you can build up a very sizeable retirement fund, most other people should be able to too. 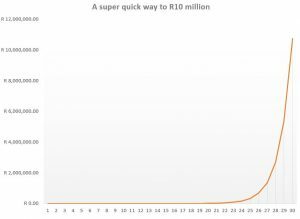 So how would a pretty average earner amass a R10 million fortune? In combination, these two forces are so powerful that they will be working for you and give you such an easy route to R10 million, that you would have to do something really stupid not to get there. Now people often say, the best way to tackle a large project is to break it down into bite sized chunks. It’s also what I do when I’m saving, and when I have a big project to complete. So for this case, let’s break it down into a daily amount to save. How much do you think you need to save every day to build up a R10 million portfolio by the time you’re 65? No you’re wrong. The daily savings amount is just R31. For less than the cost of a pack a day smoking habit, you can one day be very wealthy indeed. Now being a future teacher you’re going to tell me that just giving the right answer isn’t good enough, you want to see the workings. Well okay, click here to see how I got there. As you can see, by investing just R31 a day, or R930 a month in the market, which has returned an average of 16.7% a year, and then only increasing that amount by inflation, you’ll be worth R10 million in today’s money. Even more amazingly, your total contribution to that will be just 1.7%, with compound interest doing all the rest. Just like in the earlier case where the model managed to build a bigger retirement portfolio in 7 years than her doctor sister could in 40, compound interest has given you a huge gift. It’s the equivalent of you contributing just R170 000, with compound interest contributing the remaining R9.83 million. This is an offer too good to miss, and is the reason that if I was you, I’d keep the part time job while studying, and make sure you put away your R31 a day without fail. If you’re tempted to give yourself a break for a few years first take a look at the table below where I’ve calculated how much you would need to save a day starting at a number of different ages. I imagine many readers are a little surprised by how quickly the amount needed to be saved every day grows, but it’s simply the response of having less time to save and also less time to compound. In effect, you’re penalised twice for waiting to start. What you should also have picked up from the doctor and the model is that starting early is really far more important than saving a lot. Luckily for you, you’re very young, and R31 a day isn’t a huge amount. I also happen to know that last year, the teachers pay scale got inflation +1% increases, and as an added bonus, as they get more experience they also climb up a level in the scale. This means that every year it will be easier and easier to save what you need to. For once it’s a target that gets easier to reach the closer you are to it! Now I have a challenge for you and any other teachers who might have stumbled across this post. For some reason financial literacy isn’t part of the school curriculum. I wish it was, and even plan to volunteer my time teaching it for free one day when I no longer feel like working, but for now, please see if you can work it into some classes. Maths would be a good fit, particularly when you start talking about interest. A simple exercise showing how massive investments can grow compared with how scarily credit card debt can also grow would do wonders. I still remember the exercise when I was a child. If you could convince a wealthy Sheik (or Gupta?) to pay you for a month, 1 cent on the first day, 2 cents on the second, 4 cents on the third and 8 cents on the fourth. 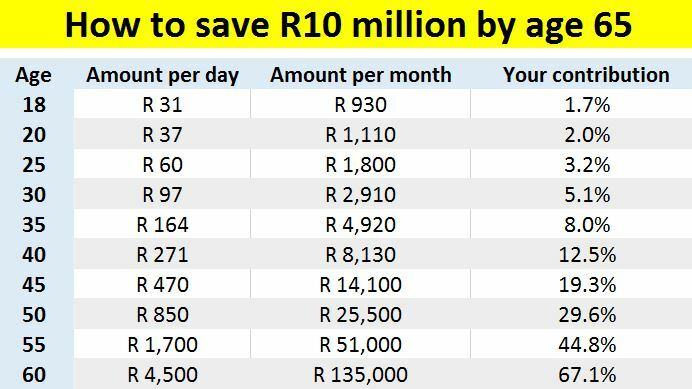 Keeping that up for 30 days will also mean you will amass R10 million! 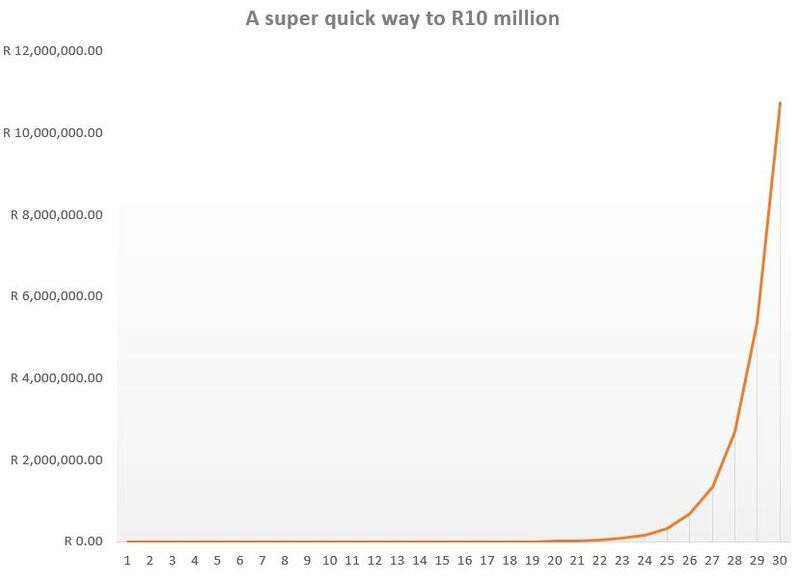 *Just for fun, I also calculated how much you would have to save per day for a newborn to reach R10 million at 65. Any guesses? Amazingly it’s just R5.30 a day. Now obviously a child has no money to save, but as a parent, you can take care of the first 18 years of your kids savings for less than the price of a coke a day. Disclaimer: This information is not advice as defined and contemplated in the Financial Advisory and Intermediary Services Act, 37 of 2002, as amended. Please only use this information as a guide, it is an indicative calculation only. Do not base any decisions on it without getting proper advice from someone with a license to do so!